Recently I wrote a post about failure, and one of my regular readers, Tina, who blogs at Philosophy and Fiction, liked one of my pithy pieces of advice on how to deal with failure. Failures are nothing to be ashamed of. Talk to your friends and family about what went wrong. They may be able to help, or at least offer some comfort. Even if they can’t help you, telling them your story might help them. Keeping things secret never helps anyone. So I had the amazing/stupid idea of putting this into practice on more formal terms. I propose to create an international Admit You’re Wrong Day. As many of you are bloggers, I challenge you to have a go yourselves. It might be therapeutic, if it doesn’t leave you looking like a complete idiot. I’m going to kick this off myself, and so my next two posts will be called I was wrong about religion, and I was wrong about nuclear power. This entry was posted in Life and tagged Belief, Blogging. Bookmark the permalink. Good for you. I might just give it a go myself although I suspect that it could be a never ending list of things that I’ve got wrong but like they say, “nothing ventured nothing gained”. I always felt that getting things or opinions wrong helps to get things right in the future as long as you learn from your experiences. Have a good day. We all make mistakes, but the biggest mistake of all would be pretending to ourselves that we don’t. Your italicised words are wonderful advice Steve – hard for the proud to apply, yet efficacious for all nonetheless. I think that as bloggers, assuming we make our sites available for commenting upon, then we leave ourselves open to being, if not proved, then accused, of erring in what we write. For example, my last post evoked hostility in two commenters, one of whom retracted upon reflection, the other writing my position off as ‘wrong’. It’s not for me to say which of us erred, though in posting all but the most anodyne thoughts, we invite others to demonstrate any weakness in our ideas. Hariod, I have certainly learned a lot from having my ideas challenged by readers of this blog – yourself included. I greatly value such exchanges, and it is clear that you do too. I attempted to help a fellow reader who posted an admission pertaining to how she was excessively worrying about her children. She openly wondered if she was crazy and implied that her thinking was irrational. When I verified that indeed her thinking was irrational and suggested ways she could ease her emotional disease she became hostile telling me I was irrational. I could see that she was not ready to explore her irrationality even though she had posted on it. If you already know you are going to justify, and you haven’t changed your mind, then that leaves me to assume you’re only looking for another way to get people to read about your disdain for the topics. Is this the case? Very well said Steve. Anyone who holds the exact same opinions on everything over time has stopped listening and thinking. When we publish those opinions, we have a tendency to lock them in, which can become a self made trap. The more strident we are, the more we will need to apologise later if we got it wrong. I’ve repeatedly found that the ability to apologize is one of the most important virtues a human can have. Great blogging topic! I’ve been wrong so many times I can’t remember them all. Just the two days ago I diagnosed my husband’s symptoms as due to high blood pressure (he gets anxious when his BP is high, so I figured that’s what it was). I took his BP manually, and sure enough, it was high. We looked into his medications and found out that he’d been cutting a pill in half because he thought it was 100 mg when the doctor had actually switched it to 50 so he wouldn’t have to cut it in half. I smugly declared that I must have doctor genes. Boy did I feel smart. Well, his symptoms got worse and we went to urgent care. I apparently don’t know how to use a manual sphygmomanometer because he didn’t have high blood pressure…instead he had pneumonia and possibly a urinary tract infection! Good one Tina! On the other hand, the urgent care doctor declared that he was dehydrated and told him to drink Gatorade. Luckily, we had an appointment with a proper doctor the next day, and he told me to take him to the ER right away. Wow Tina. I just doesn’t seem like you’re going to get a break this year. Hope he recovers soon and well. A sphygmomanometer? I hope someone has come up with a shorter nickname for those things. Six syllables is just too much, except for showing off. This has been probably the worst year of my life. It’s up there with the year my father died, but I’d say this year wins. The fact that you know that word is six syllables is impressive. I’m still counting on my fingers. My count is eleven syllables. Don’t be impressed. I cheated and looked it up. Online dictionaries have audio pronunciations these days, which is awesome! Oh good! I feel so much better. Although I wouldn’t be surprised if you, being you, just happened to know that sort of thing. Oh dear, I hope your husband makes a quick recovery. I had not even heard of a sphygmomanometer, so I will definitely not trust myself in future. I’m still thinking about my “Admit You’re Wrong Day” entry. Might I suggest, just to give us time to gather our thoughts, an interim “Admit Steve Morris W as Wrong Day”? That sounded much funnier in my head before I posted it. I guess I was wrong. No, you were right. I get things wrong every day. 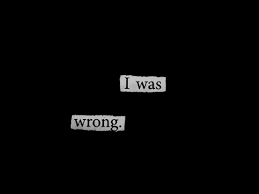 It should obviously be “Admit I’m Wrong Day” although that sounds stupid. Back to the drawing board! My blog is largely about how wrong I’ve been. Personal responsibility and integrity are the most important tools to have in your tool belt.